In 1990 a typhoon swept through Seoul, lashing the capital with rain and wind. Among the damages the typhoon visited on the city, it knocked over a white pine in a small courtyard not far from Gyeongbokgung Palace’s western wall. The tree had been the largest of its kind in the country, 16 meters tall, but the storm was larger. Now, if you pick the right alley to walk down and find the courtyard, you can still see the stump, the only part left. But surrounding it you’ll also see four sturdy young white pines, descendants of the original. The neighborhood that the trees are in is an old part of the city, old enough that a single cardinal direction was enough to christen it. The area is called Seochon, meaning “West Village,” on account of its being west of the main palace, and it was the traditional domain of the jungin, the “middle people” – doctors, interpreters, merchants. Even today it retains a modestly residential character. 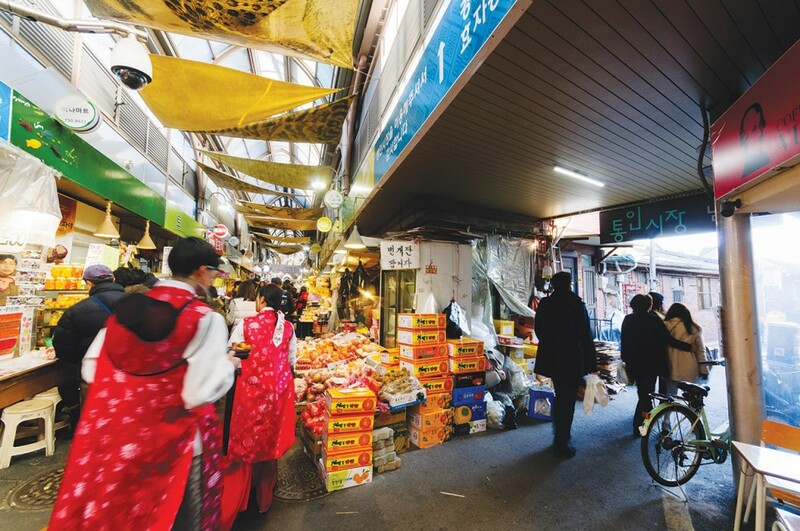 For decades, while other parts of the city were redeveloped or even built from scratch, Seochon was largely left to itself, a benign neglect that left it with a unique character and appearance. Now, however, that’s changing. Seochon is being rediscovered and reinvigorated, but, like the young white pines cut from the old original, its new growth often maintains strong links to the past. This connection is most visible through the actual buildings that make up the neighborhood. 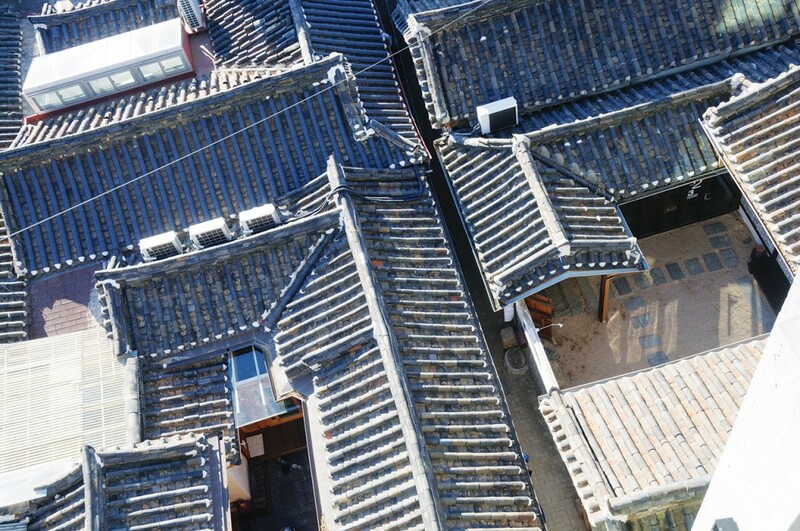 Seochon has one of the largest concentrations of hanok in Seoul, and the city is currently doing much to encourage their preservation. 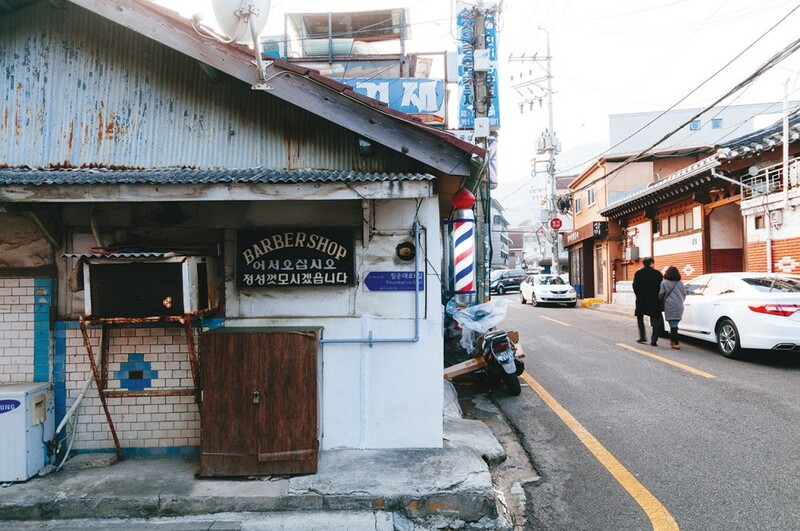 Walking through the neighborhood’s backstreets you’ll inevitably come across many old hanok, with their black tile roofs and handsome double doors, but this is also one of the few places in the city where you’ll find newly built hanok too. One such building houses Tongin Herbal Medicine Dispensary (T. 02-725-0111), a perfect example of Seochon’s melding of old and new. It’s the type of business often associated with the Seoul of the past, but in fact it only opened in 2013. “There’s a strong sense of community and a lot of tradition in this neighborhood,” Kim Yoon-sung, one of Tongin’s pharmacists said, explaining the decision to open here. “I thought an oriental pharmacy would go well with this neighborhood.” Sitting in the shop, with the sweetly medicinal smell of ginseng in the air and a wood-burning stove heating the room, you wouldn’t assume you were in a modern building, but, as Kim revealed, the hanok only predates the business it houses by two years. 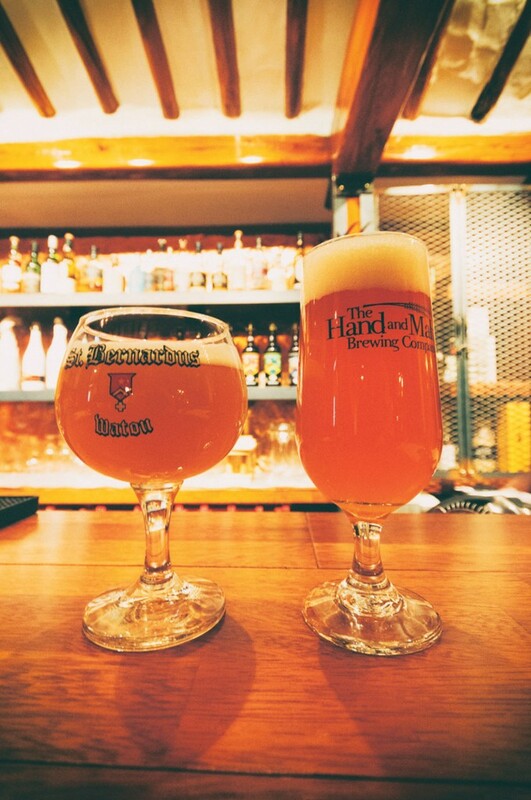 Shin is one of several founders of Hopscotch (T. 02-722-0145), a gastropub whose first branch opened in Gangnam in 2013. 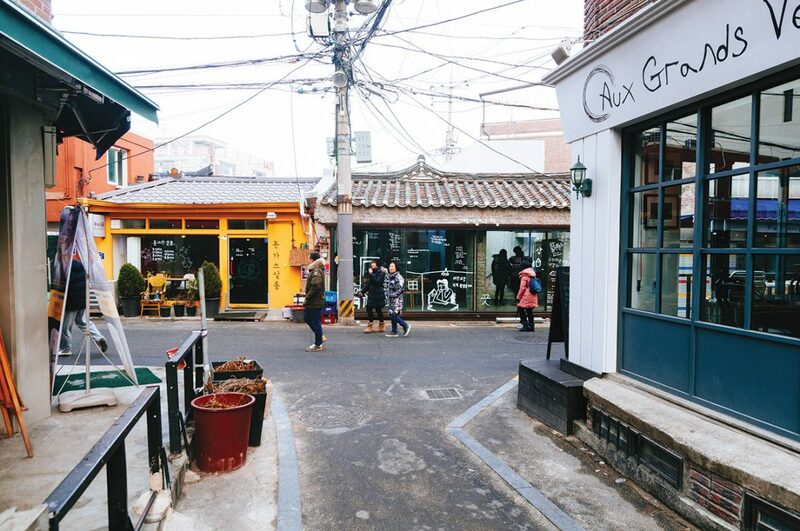 “We wanted to open [a second branch] north of the river,” Shin said, “and if we’re going to do it there, why don’t we do it in a hanok?” Shin and his partners found an old hanok for sale and renovated it, restoring its original parts and adding new ones. Since opening in Seochon, Hopscotch has been at the vanguard of some exciting culinary changes in the neighborhood. Where not long ago dining options were limited to traditional Korean fare, there’s now much more diversity, exemplified by Hopscotch head chef David Cho’s menu of perfectly seared steaks and jambalaya pasta, and a beer list that encompasses both obscure Belgian imports and craft brews from Gyeonggi brewers the Hand and Malt. For more traditional eats there’s Tongin Market (closed Sundays and holidays). It still functions as a traditional wet market, but nowadays features numerous restaurants and cafés catering to visitors from outside the neighborhood. The best way to experience it, though, is to take advantage of its innovative dosirak, or lunchbox, program. For a few thousand won you get a tray and some antique Korean coins to use as tokens, which you can redeem at different stalls to fix yourself an à la carte lunch. In a place with as much history as Seochon, it’s no surprise that it’s been home to some notable people, and Seochon is particularly associated with its artists. Yi Sang was one of modern Korea’s most significant and original authors, creating experimental poetry and fiction that would go on to influence later generations of Korean writers. He died of tuberculosis in a Tokyo hospital in 1937 at the tragically young age of 26, but before that he spent most of his life in Seochon. Two years ago the House of Yi Sang (T. 070-8837-8374) opened on the site of his former home. The renovated hanok (not the actual building Yi lived in) now houses a café and hosts various cultural events. A few blocks away is the Park No-su Museum (T. 02-2148-4171), housed, in this case, in the actual home of the renowned painter, considered by some to be the father of modern art in Korea. Shortly before Park died in 2013, he donated his home and artworks to Jongno District, and now visitors can stroll through the house admiring his works. It’s hard to say which is more beautiful – the elegant two-story house, which melds Western and Eastern influences, or the lovely paintings, which update traditional motifs with stylized, modern brushstrokes. Along with the Park No-su Museum, Seochon’s most acclaimed venue for art is the Daelim Museum (T. 02-720-0667), whose exhibitions focus on photography and design. Past exhibits have ranged from Danish furniture designer Finn Juhl to photographer Linda McCartney. The building itself is worth its own viewing, with a geometric façade that nods to Korea’s traditional bojagi textile patterns. The Daelim is Seochon’s grand old dame compared to all of the new galleries that have been popping up recently. Among those newer spaces, two merit particular mention. One is the Ryu Gaheon Gallery (T. 02-720-2010), which exhibits photography and is housed in another restored hanok; the other is Boan Yeogwan (T. 02-720-8409), a former inn that in the post-WWII years provided cheap rooms to artists and has now been turned into an exhibition space. Galley hoppers are spoiled for choice in Seochon, but the neighborhood perhaps rewards simple aimless wandering even more richly. Strolls down its side streets and alleys yield things to savor, both old and new. Steps from Tongin Herbal Medicine Dispensary is Yeonghwaru (T. 02-738-1218), a Chinese restaurant over half a century old and a favorite of staff at the Blue House. Turning down a tiny alley near Hopscotch leads you on a zigzag between lovely old hanok pressed so close together they seem to squeeze out the past hundred years. Near the Park No-su Museum is Okin Arcade (T. 02-737-4788) – open under one name or another since 1988 – where young couples on dates mash buttons and reconnect with a very different version of the past: early ‘90s video games. Just down the street is L’eau Magique (T. 02-6348-1073), where Seochon’s new artisans create tailored perfumes. 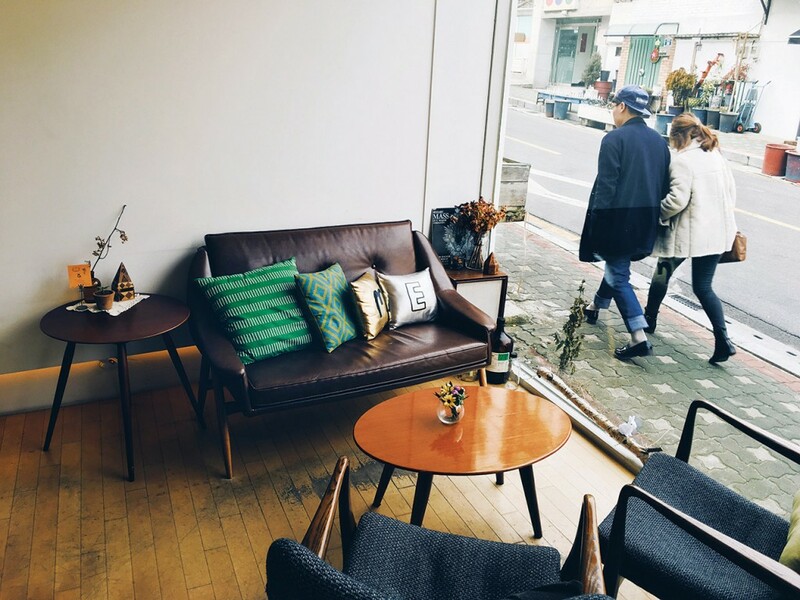 And not far from Daelim Museum is Spring (T. 02-725-9554), one of the neighborhood’s many cozy cafés, where you can order a coffee and gaze out its large back window. In the courtyard down below is the base of a tree, the trunk and branches gone, but the remains still possessed of a solidity that tell its former stature, while around it four young white pines grow. Pizza might not be the thing that pops into mind when you think of Seochon, but two of our favorite pizza joints are hidden here. In “Sejong Village Food Culture Street,” a lively street of restaurants and pubs near Gyeongbokgung Station (Line 3), Exit 2, is BeeZza (T. 02-722-1832), a trendy pub that serves craft beer and pizzas baked in clay ovens. Tucked in an alleyway near the Park No-soo Museum, meanwhile, is Ogin Pizza (T. 02-737-9944), a cozy hanok-style pizza place renowned for its creamy sweet pumpkin pizza and ricotta cheese salad. 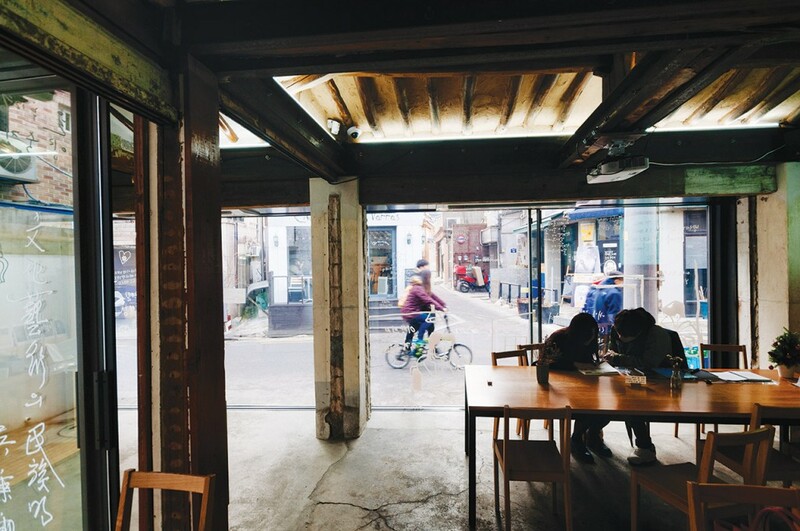 As for cafés, we like Nuha-dong’s Ohoo Café (T. 02-444-1288), where the large, plate glass windows lend themselves to people-watching. Oh, and if you’re looking for a place to pick up a copy of Kinfolk, try Seochon Garage (T. 02-732-0106), a “creator market”/studio where, in addition to magazines, you’ll find crafts by local creatives.